We Identify Profitable Trades. Learn How. We profile powerful trades in our daily videos. You’ll get 3 - 5 trade ideas from our pro traders every week. Simply place the trades with the broker of your choice. Get updates and learn when to exit. Our professional team of traders with over 30 years of collective experience work around the clock to consistently get you maximum profits with minimal risk. We use our proprietary system to filter through 3,000 stocks each day and show you how to find the most profitable short and medium term trades. 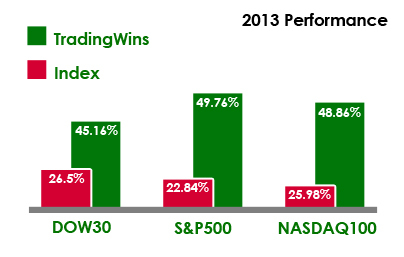 Trading Wins brings a true institutional/hedge fund level service to the individual trader. You think we are confident? Why wouldn't we be? Our business is based on trust and integrity. Don’t take our word for it, here is what other winners are saying. "I'm always looking for every edge that I can get. In this business, performance is everything and their performance is outstanding."